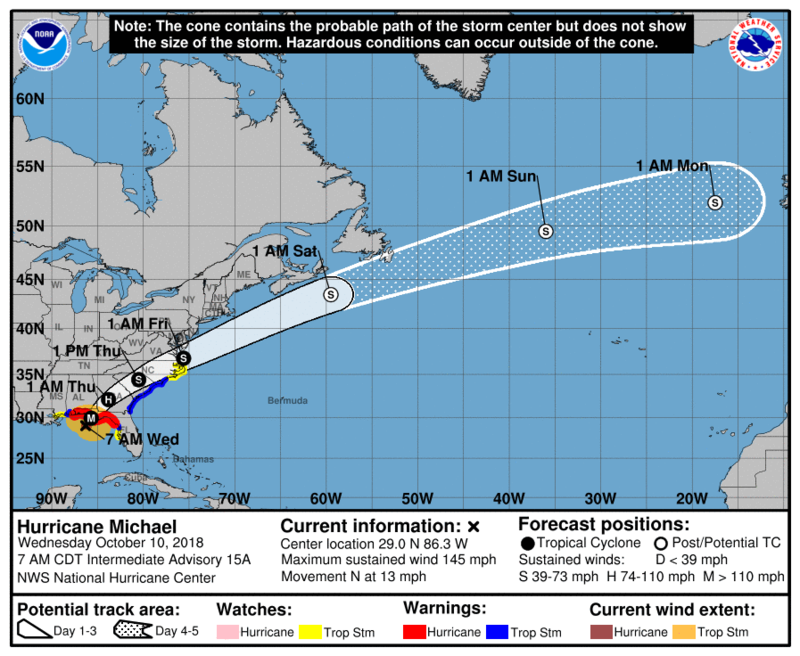 Editor's Note: Click on image for link for National Weather Service updates on Hurricane Michael. ST. PETERSBURG, Fla. — The Coast Guard established an Incident Command for Hurricane Michael response in St. Petersburg, Tuesday. For media inquiries please contact the St. Petersburg Coast Guard Joint Information Center at 727-502-8710 or after hours at 305-965-4672. Call 911 or use VHF-FM Channel 16 to report emergencies. Social media should not be used to report life-threatening distress due to limited resources to monitor the dozens of social media platforms during a hurricane or large-scale rescue event. Stay clear of beaches. Rip currents can continue well after the storm passes. Even the best swimmers can fall victim to the strong waves and rip currents caused by hurricanes. To report any pollution contact the National Response Center at 1-800-424-8802. Navigation hazards, including unforeseen shoaling and submerged objects are common after storms. Navigational aids may be damaged or have moved. Use caution when transiting any waterway impacted by Hurricane Michael.